Just about anyone who has visited Loreto knows that Parque Nacional Bahía de Loreto (PNBL) is special, and worthy of protection. But what’s the best way to spread that message worldwide? 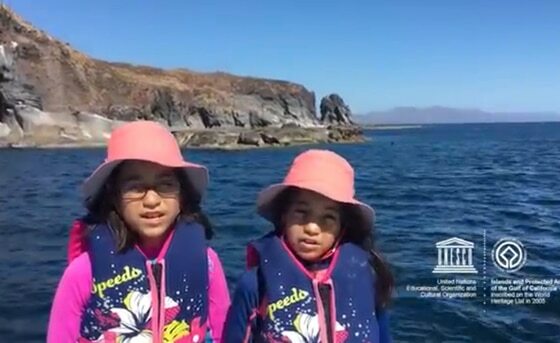 here you go: The Loreto Children Featured in UNESCO World Heritage Video! Or at least that’s part of the solution put forth by the United Nations Educational, Scientific, and Cultural Organization (UNESCO). A group of children thought it would be a good idea, as a celebration of World Oceans Day on June 8, to have children worldwide say why they love the ocean and to join with adults in pledging to protect our ocean treasures for future generations. Eco-Alianza programs had instilled in them the love and respect for the ocean that would shine in the videos. PNBL supplied a boat to take Edna and the children to Isla Coronados to film their pledges, and the rest is history. In a ceremony in New York, Prince Albert of Monaco was the first to sign the pledge, accompanied by dignitaries and some of the children who had sent in video pledges. HSH Prince Albert of Monaco II was the first to sign The Ocean Pledge. Photo courtesy of UNESCO. People from across the globe are invited to sign the pledge digitally on the website of UNESCO’s World Heritage Marine Programme, HERE and on social media using #MyOceanPledge . In 1972, the UN passed the World Heritage Convention in Paris, asking countries around the world to designate cultural and natural sites worthy of special protection. Since that time, 1,052 World Heritage sites have been approved — 814 cultural, 203 natural, and 35 mixed. Of the 203 natural sites, 49 are World Heritage marine sites, including the Islands and Protected Areas of the Gulf of California approved in 2005, and of which our Bay of Loreto National Park is a part.